Fort Valley State University has enacted the clear bag policy for all FVSU Department of Intercollegiate Athletics home events throughout the 2018-19 academic year. Bags that are non-clear and/or are larger than those outlined in the policy will not be allowed in the stadium. 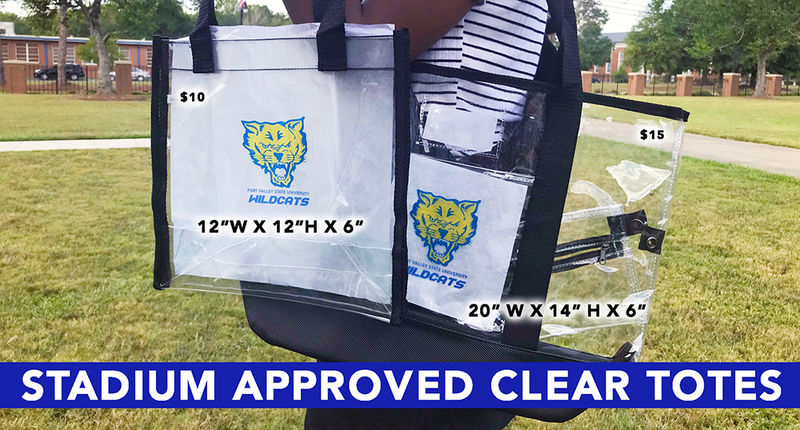 LARGE TOTE: If fans are bringing bags to a home FVSU athletic event, bags must be clear and not exceed 20″ (by 14″ by 6″) or be a clear 1-gallon re-sealable plastic freezer storage bag, one per person. Bags must be clear plastic, vinyl, or PVC. SMALL TOTE: 12″ (by 6″ by 12″) or be a clear 1-gallon re-sealable plastic freezer storage bag, one per person. Bags must be clear plastic, vinyl, or PVC. CLUTCH BAGS: The only non-clear bags permitted are small clutch bags (with strap) that are the size of a hand. Exceptions will be made for medically necessary items after proper inspection at designated areas. Contact the FVSU Foundation, Inc. for more information 478-825-6474.